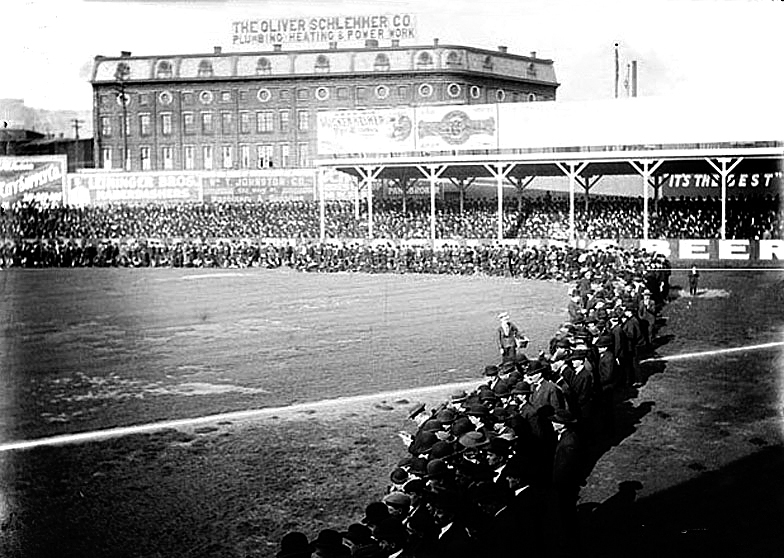 April 28, 1909 -- The Cubs come back in the ninth inning to beat Cincinnati in a squeaker, 6-5. Another sports reporting gem, this one by I. E. Sunburn in the Chicago Daily Tribune. "Meek as so many cosset lambs during the early innings of today's game," he writes, "Chance's [player-manager Frank Chance] men suddenly tore off their disguises, converted themselves into ravenous wolves, snatched away from the Reds the victory which was apparently clinched, and plunged a stiletto deep into the vitals of Clark Griffith [Cincinnati's manager]." Reds pitcher Bob Ewing was in command until the seventh inning when he allowed two runs, but the Wrigley nine was still down by three going into the top of the ninth. Chance led off the final frame with a single to right. Third baseman Harry Steinfeldt "poled a long fly" to left, but shortstop Joe Tinker "smashed one so hot that [Red shortstop Mike] Mowrey had no chance of stopping it. Outfielder "Circus Solly" Hofman laced a line drive into center. Chance scored, and "only two runs were needed to tie her up." Cubs second baseman Heinie Zimmerman pulled a line drive between short and second and Reds left fielder Dode Paskert, hustling to cut down a run at the plate "fumbled the ball in his eagerness and it bounded gleefully back toward the fence." Tinker and Hofman scored and Zimmerman "sneaked around to third a toenail ahead of Paskert's throw in." Cubs catcher Pat Moran hit a bounder to Reds second baseman Miller Huggins, who made "a fine shot to the plate to nil Zim's run," but Cincinnati catcher Frank Roth dropped the ball. That was all that was needed to seal "the grandest rally that has been pulled off this season in any section of the map." The game was played at Cincinnati's Palace of the Fans, pictured above.